Right place, right time…Jon and I made a pact to get out of the office today. We climbed up a steep trail to see where the snow line was (3600′ elevation, right where we expected it). Stopped to take a break on a rocky exposed rib above a creek gorge to watch rain squalls shroud the tops of mountains and fill glacial valleys with silver. I munched some toasted almonds and looked across the canyon. Wasn’t too surprised to see a mountain goat, because we often see them from this location. But this one had kids! Brand new twins! As we gaped in awe, the little critters nosed under her to find a teat, disappearing between her hind legs. She chewed her cud, stretched down to browse on some dry plant, then reached to lick one of the kids who had huddled up into a creamy dot against the rocks. Before long it was on its feet, poking around. 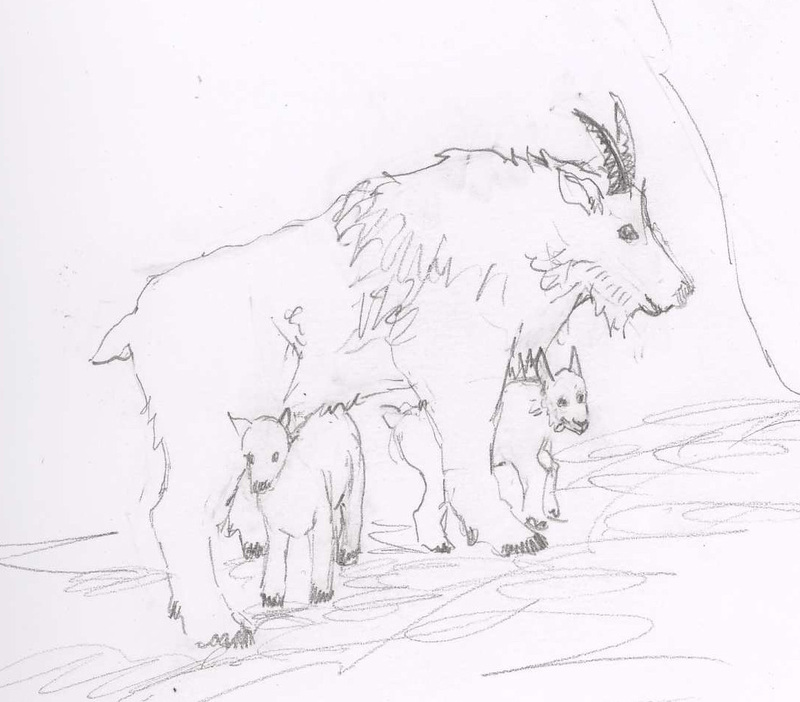 The kids were small enough to shelter under their mother’s body, and she was attentive that they didn’t stray too close to a cliff. Below us, melting snow thundered through a narrow cleft in the broken basalt and a waterfall made a white trail upstream of the goats. They were in vertical terrain, safe from any predator. We were smitten with them. Mountain goats give birth to their young in late May and early June. These kids could be just a few hours or days old. I can still see them in my mind. My camera was down in the truck not in my pack, and probably would have not showed up anyway. So I resorted to drawing from memory. Just a rough sketch. Seeing them today was the highlight not just of this day, but maybe the whole week. The newness of them, the protectiveness of the mother, how perfect they are for that place…how lucky we are to notice them.